Yes closed out 2016 with news that they would be inducted into the 2017 Rock And Roll Hall Of Fame during an April event in New York. As various current and former band members commented on the recognition by the Rock Hall, it was remarks by original Yes singer Jon Anderson in early March that shook the rock world when he revealed that he and Rush bassist Geddy Lee would join the group for a performance at their induction the following month. Both the Rock Hall and Rush’s management went into full-on damage control mode by issuing statements denying Lee’s involvement with Yes at the April event, leaving fans to wonder if the Anderson’s remarks were an accidental leak or an honest mistake. Fans went to progressive rock heaven on April 7 when Lee did, in fact, perform the 1971 classic, “Roundabout”, with the group at New York’s Barclays Center after he and Rush bandmate Alex Lifeson had the honor of inducting Yes into the 2017 Rock Hall alongside Pearl Jam, Journey, Electric Light Orchestra, Joan Baez and Tupac Shakur. Yes also delivered their 1983 US No. 1 hit, "Owner Of A Lonely Heart", with guitarist Steve Howe handling bass duties. An ongoing battle over control of the Yes brand resurfaced following the Rock Hall induction as two competing lineups announced North American tours. Yes, with guitarist Steve Howe and drummer Alan White, revealed plans for a summer trek under the banner “Yestival”, while a trio of band veterans – who formerly performed as Anderson Rabin Wakeman (ARW) – would hit the road and now be officially billed as Yes Featuring Jon Anderson, Trevor Rabin, Rick Wakeman. The final few shows of the Yestival trek were cancelled following the tragic, unexpected death of Howe’s son Virgil, on September 11. The 42-year-old multi-faceted musician was the longtime drummer in the Nottingham, UK band Little Barrie who also made contributions as a keyboardist on several of his father’s solo albums. In September, Yes (with Howe and White) announced the first series of dates for a 50th anniversary tour. 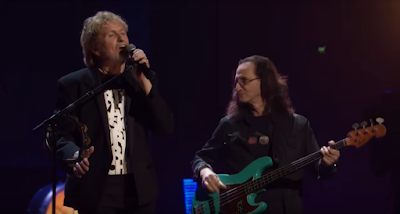 Yes closed out 2017 with the November release of “Topographic Drama – Live Across America”, which featured highlights from their 2017 shows.